The Simms G3 Guide Fly-Fishing Boot Felt is a feature-rich Simms fly-fishing boot that is designed with a 12mm felt outsole, dual density eva midsole for shock absorption and ESS plates in the midsole for superior cleat retention. With an improved fit, the 2018 G3 Guide boot comes with a molded external TPU heel counter and heel clip for maxiumum ankle support. Even though these wading boots are extremely comfortable to wear and features awesome performance on and off the water they are not weak. Large scratch rubber rand for enhanced durability and protection as well as waterproof nubuck leather uppers and high abrasion textile are added features that make these boots extra robust and sturdy. 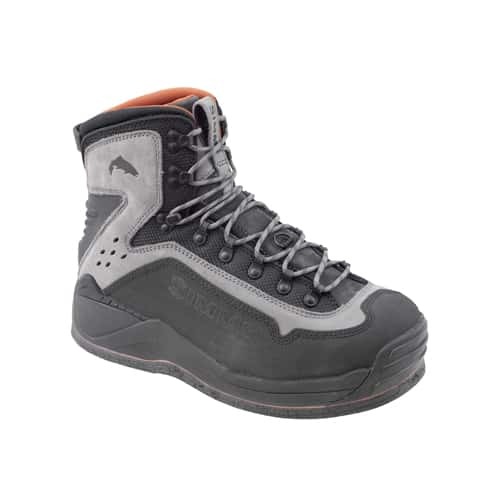 These boots provide really great gripping power on slippery rock surfaces which is why fly-fishing guides across the country prefer the Simms G3 Guide fly-fishing boot as their go-to fly-fishing boot when fly-fishing. I was amazed at how comfortable these Simms G3 Guide Fishing Boot Felt are to wear while fly-fishing. These felt sole boots are really nice and they grip slippery rock surfaces with ease. I recently changed to felt soles and I'm impressed, should give them a shot, you'd be surprised.